standards. No water pollution concern. - Sensitivity: High degree of sensitivity as Ethidium Bromide. - Convenience: Ready to Use; Same application procedures as the 6X Loading Dye. - Compatibility: Use the Blue Light or UV to detect the signal; Broad compatibility range. - Economic: Non-hazardous product; No expenses required for the waste management. Maximo Fluorescent Reagent is a non-mutagenic reagent that produces instant visualization of DNA bands upon Blue Light or UV illumination of agarose gels. Supplied in GeneON’s 6X DNA Loading Buffer, Maximo Fluorescent Reagent is used to prepare DNA markers and samples for loading on agarose or polyacrylamide gels. Maximo Fluorescent Reagent is the most sensitive stain available for detecting the double-stranded DNA (dsDNA). It contains three tracking dyes (Bromophenol Blue, Xylene Cyanol FF, and Orange G) for visually tracking the DNA migration during the electrophoresis process. It is ideal for the environment requiring a safe , non-hazardous alternative to Ethidium Bromide. 1. Vortex Maximo Fluorescent Reagent for 10 seconds prior to use. 2. Dilute 1 part Maximo Fluorescent Reagent with 5 parts DNA sample and mix. Note: Maximo Fluorescent Reagent must be added to DNA markers in order to visualize the ladder bands simultaneously with the sample after electrophoresis. 4. After the electrophoresis, remove gel and place on UV or a visible-light transilluminator to immediately visualize bands. Tracking Dyes: Bromophenol Blue, Xylene Cyanol FF, and Orange G.
Store at room temperature or at 4°C up to 12 months. For longer periods, store at -20°C. 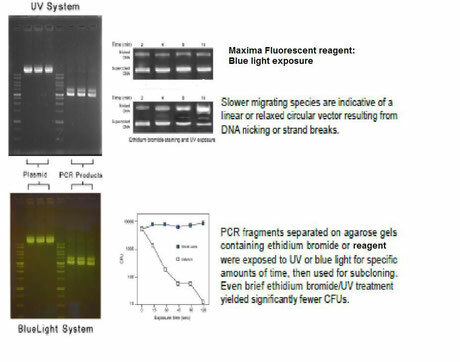 Note: Maximo Fluorescent Reagent is light sensitive and should be stored protected from light.